I'm going to do two posts about the new varieties of veggies that I've chosen for 2018 because I got a bit carried away. I'll post about peppers separately but first you get to see everything else. In alphabetical order of veggie type, descriptions and photos from the sources follow. These are just the new varieties I'm planning to grow in 2018. To see the full grow list click HERE. Seed sources for all the vegetables that I'm growing are shown on the full list. There's a few things that I'm particularly interested in this year. I'm giving soybeans/edamame another try. I love edamame but it seems to be impossible to find ones that aren't imported from China. Really? We grow TONS of soybeans in the US, why not Edamame? 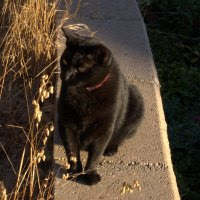 Anyway, I gave up on them in previous years because they were guaranteed to attract bunnies. Now that I've surrounded my entire veggie garden with hardware cloth I'm going to try one more time. 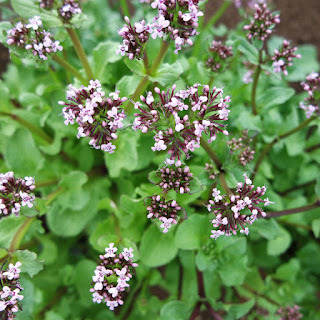 Doucette d'Alger is a cornsalad/mache relative that likes heat. I'm hoping that it will fill in the salad greens gap that I usually experience in late summer and early fall. Beni Houshi mizuna is a stunner, how could I resist. Hilmar parsley root is decidedly homely looking but I hope it adds more interest to the winter veggie scene along with Improved Helenor rutabaga. Beans: Malwai Malachite Green dry beans, Hank's Xtra Special Baking Bean, Panther Soybean/Edamame, Castandel bush snap bean, Gold Nectar pole snap bean. 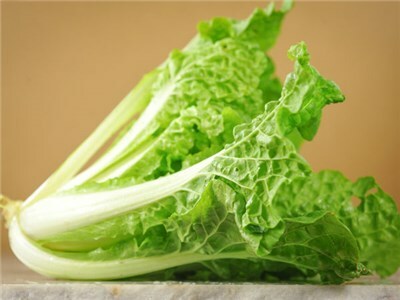 Peking Ta Ching Koo Pai Tsai Brassica rapa. 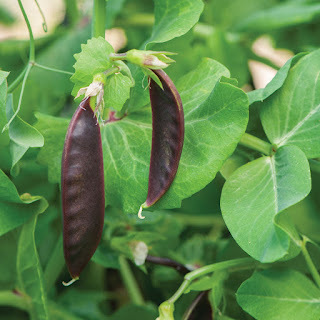 This prolific, easy-to-grow Asian Green is one of Seed Savers Exchange advisor David Cavagnaro’s favorites from his time as SSE’s farm manager. 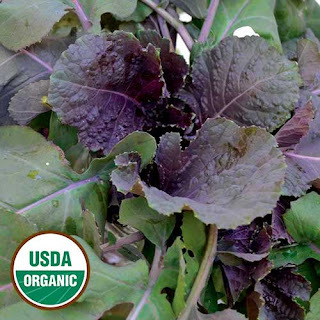 The greens can be prepared like any other Brassica greens, such as collards and kale. Growing to more than three feet tall, this variety bears lovely, large purple leaves that have an ornamental quality as well as great taste. 45 days to maturity. Hank's Xtra Special Baking Bean Obtained from Peg Lotvin, this variety was grown by her father, Hank--and many other folks in Ghent--for many years. It was harvested and delivered to Flossy, a town resident, who took advantage of the beans' tender texture and sturdy skins to produce dishes of baked beans that were creamy on the inside but held their shape well. Through our partnership with Glynwood, Hank's Xtra Special Baking bean has now bean added to the Slow Food Ark of Taste varieties, and will be introduced to regional chefs. Medium-large sized white beans with a spot of yellow and a very slight kidney shape. Bush habit. 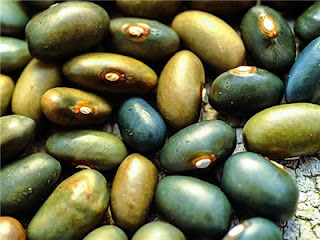 Malawi Malachite Dry Beans The Malawi Malachite Green beans were brought to Malawi by German colonizers in the 1800s who grew them as the Malachite Bean. They have a beautiful iridescent green shimmer like malachite. The seeds are brought to us by William Woys Weaver, an internationally known food historian, author, and heirloom gardener living in Devon, Pennsylvania. His Roughwood Seed Collection began informally in 1932 by his grandfather H. Ralph Weaver (1896-1956). When William discovered this seed collection in a freezer many years later, he decided to grow out the rare and unusual plants his grandfather had accumulated. While our original seed came from Malawi (Africa), we later discovered that this highly productive bean was developed at the former Royal Agricultural Academy in Hohenheim, Germany. It was later exported to Africa while the German Empire maintained colonies there prior to World War I. Dating to the 1850s, this unusual bean was known commercially in Europe as the Malachite Bean due to its unique blue-green color similar to the mineral of the same name. The 4-inch pods on 6-foot vines ripen brownish-yellow with 5 to 6 beans per pod. Try this bean for an unusual green bean soup! Terrific flavor. A portion of each sale will go to support the work of Dr. William Woys Weaver. Panther Soybean This terrific edamame variety was sent to us by Jack Algiere of Stone Barns Center for Food and Agriculture in Pocantico Hills, near Tarrytown, New York. He's been saving it for many years, as the variety is no longer available in catalogs. But now we've got it--and we can report that it is really lovely. The beans are bright green with a hint of purple when at the ripe green edamame stage and then mature to deep black when dry. (Any color in the fresh beans fades upon cooking.) If you've never grown soybeans in your garden, it's worth a shot: in addition to fixing nitrogen and yielding tasty beans, the plants sport velvety green leaves that are very attractive. Gold Nectar Pole Snap Bean (Organic) Phaseolus vulgaris. Round Yellow Pods. 70 days. 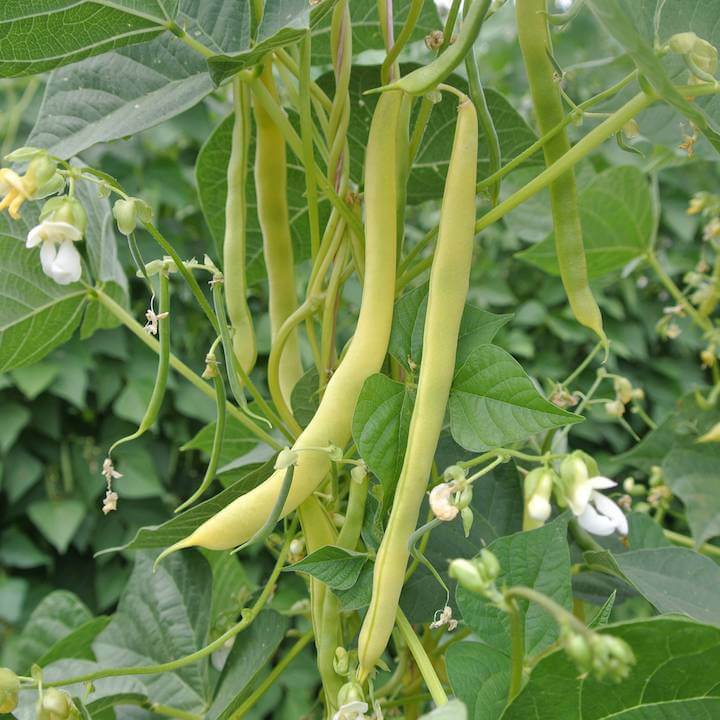 Yellow/wax bean yields lots of crunchy beans with excellent sweet and beany flavor. The 9″ long straight pods are ½” wide with a semi-flat shape. 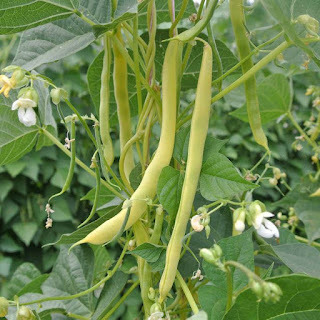 Anne Berblinger of Gales Meadow Farm in Forest Grove, Oregon, says about Gold Nectar, “We have been searching for a yellow pole bean with outstanding flavor. This one is it.” It starts fairly early and produces tender beans until late in the season, drying down seed very slowly. This trait is great for delicious snap beans but is a challenge for our seed production. We collected this variety at a seed swap in Belgium; unfortunately we don’t know much about its history, although it might be related to the variety Neckargold. 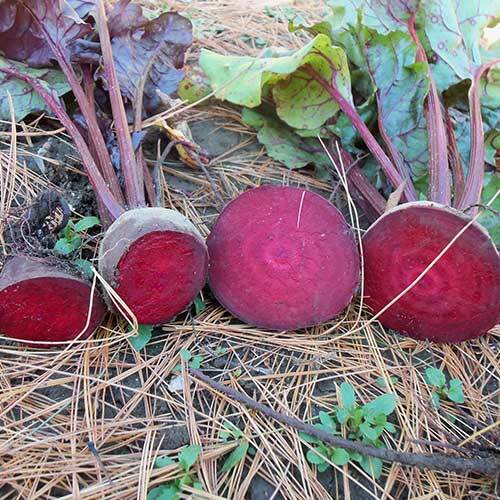 Sweetheart Beet This variety was released in 1958 after being developed at the New Hampshire Agricultural Experiment Station by Dr. Albert F. Yeager and Prof. Elwyn Meader. 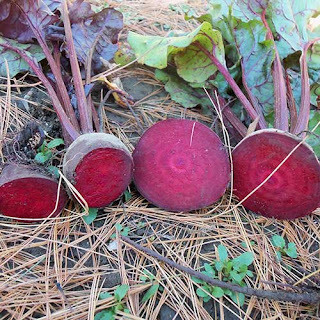 It is a cross between the Detroit Dark Red table beet and U.S. #225 sugar beet, resulting in a red table beet with the sweetness of a sugar beet. This heart-shaped beet produces sweet roots with dark purple-red flesh. Late-maturing and a good keeper. Filderkraut Cabbage This historic variety is documented in the United States as early as 1872 by the Henry A. Dreer seed company of Philadelphia, PA. Dreer’s 1872 catalog describes the variety as “A new variety from Stuttgart; a favorite German variety, with solid conical heads.” This is a long-season variety that does best when planted in the spring. Donated to SSE in 1999 by Garrett Pittenger of Ontario, Canada. 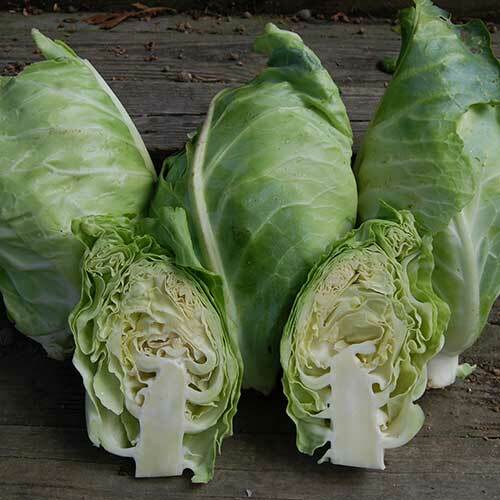 Pai-Tsai Chinese Cabbage A quick growing, non-heading Chinese cabbage, this variety is absolutely scrumptious. 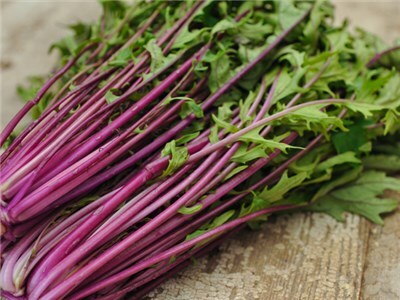 The stalks and leaves are both very refreshing and mild, with a mild nutty flavor. An added bonus, the flowers of this variety have a candy sweet and nutty flavor, so the plants occasional bolting can be a real treat! 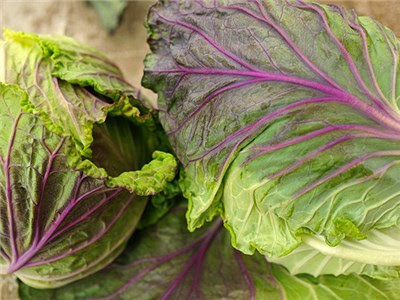 Violaceo di Verona Cabbage A vintage heirloom cabbage that originated in the region of Verona in Northern Italy, with stunning, lightly savoyed violet and green leaves that get more vibrant as the cool fall and winter weather set in. Thanks to an appreciation for traditional cuisine, Italians have preserved this variety from antiquity. Perhaps it is the impressive heat and cool tolerance of these hardy plants, or the beautiful violet leaves that have kept this treasured heirloom alive despite general downsizing of seed diversity. Medium sized round heads mature 120 days from seeding. With violet colored wrapper leaves and yellow-green inside leaves, they are an ideal choice for a fall/winter harvest. It is frost hardy, and in warmer areas can be harvested until New Year. Kyoto Red Carrot (For fall planting only.) 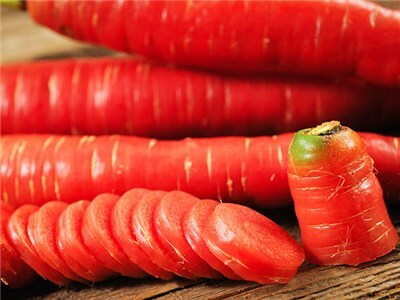 This is a Japanese kintoki type (sweet red) carrot. These silky red carrots are grown near Kyoto, Japan, where they are traditionally eaten on the Japanese New Year, often carved into the shape of a plum blossom to represent fertility in the coming year. These carrots have an exceptional texture and sweet flavor. 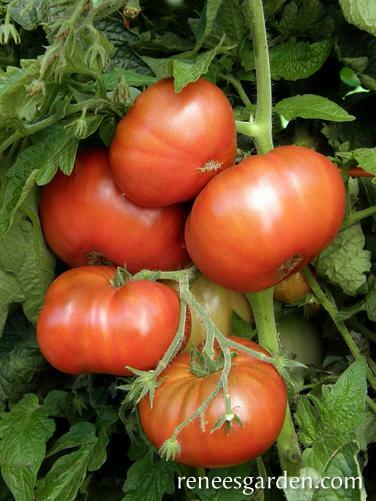 A perfect variety for late summer, fall or winter gardening, the bright red color becomes much darker when grown in the winter. (This variety may not do well if planted in the Spring) Long tapered roots grow to 10” to 12” inches long. Prinz Celeriac A European staple gaining popularity here, celeriac (a.k.a. celery root) produces big, solid knobby roots just above the ground. Once peeled, the white flesh has the flavor of mild celery and parsley. Our German-bred Prinz offers nutty, sweet flavor, fine texture and reliable, big yields that hold for harvest well in the garden. Shred celeriac for salads with a mayonnaise, lemon and mustard dressing, or cut up and simply roast or braise or add to soups and stews. Chives, Polyvit (Organic) Allium schoenoprasum. Perennial in zones 3-10. Produces bunches of dark green, pungent, onion flavored leaves that are very versatile in the kitchen. Plants grow to about 12″ tall. Very hardy plants withstand neglect, can grow in sun to part shade, and are great for containers. 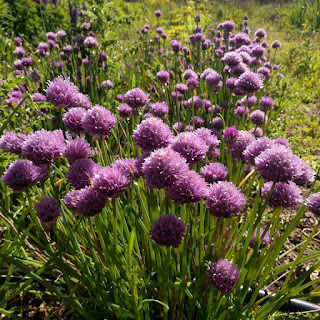 In midsummer, plants produce pretty, little, light purple, globe-shaped flowers that are also edible, are pretty enough to grow as an ornamental, and provide a good nectar source for beneficial insects. 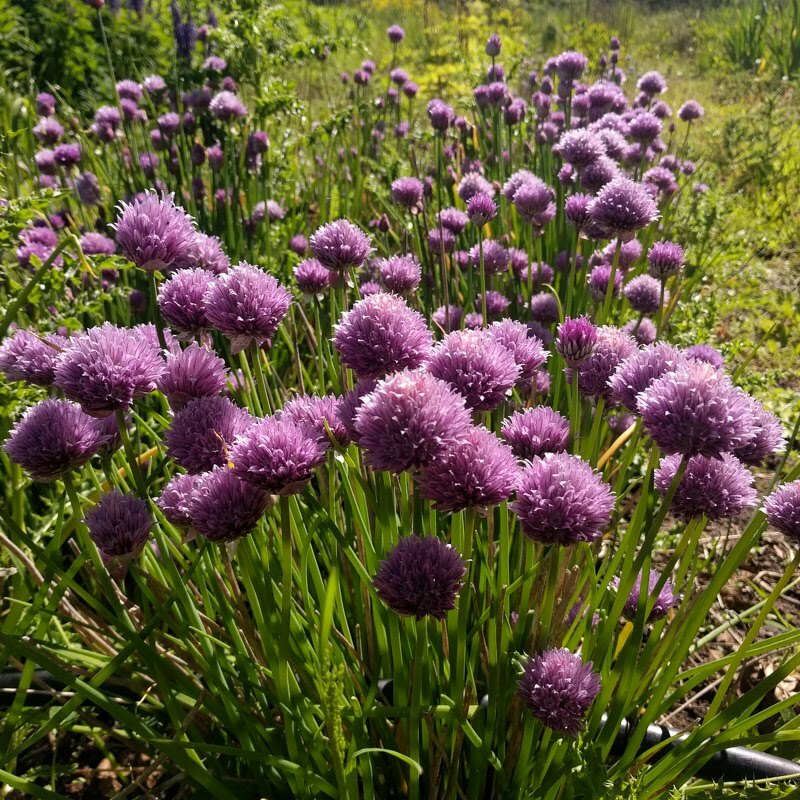 Chives deserve a place in every perennial herb garden. Not only are they good in salads, sauces, and many other dishes, but you can substitute them for onions in a pinch. This is an improved variety, known for uniform, robust growth. Yellow Cabbage Collards 45 days to maturity. A rare gem, these scarce seeds are highly coveted and have been passed down for many generations in the Carolinas, where this tender collard green reins supreme. Yellow cabbage collards were first cultivated by Colonel Joe Branner in his Asheville, Carolina, greenhouse in 1887 where he noticed his collard greens were much more tender and less bitter than other collards he had tasted. Over many generations of selection for super tender, buttery greens, this variety is unparalleled in taste and texture. Indian Coriander (Coriandrum sativum) Highly scented with a citrus top note. The dark green leaves are regularly cut to prevent this fast growing variety of Indian Coriander from bolting. 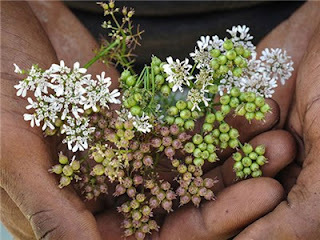 Once bolted, the seeds are a must in Indian dishes and are especially good when used still “green” and tender. Little Potato Cucumber (aka Khira Balam) Originally from India. Introduced into the 1997 SSE Yearbook by Indiana member Robert F. Bruns who got his seed from the USDA. Nearly round 3" fruits with brown russetted skin are borne heavily on robust semi-bush plants. Delicious lemon flavor. Stays crisp in storage. 70 days. Doucette d’Algers / Horn of Plenty (Organic) Fedia cornucopiae. 30-40 days. A delicious walnut flavored, tender salad green. 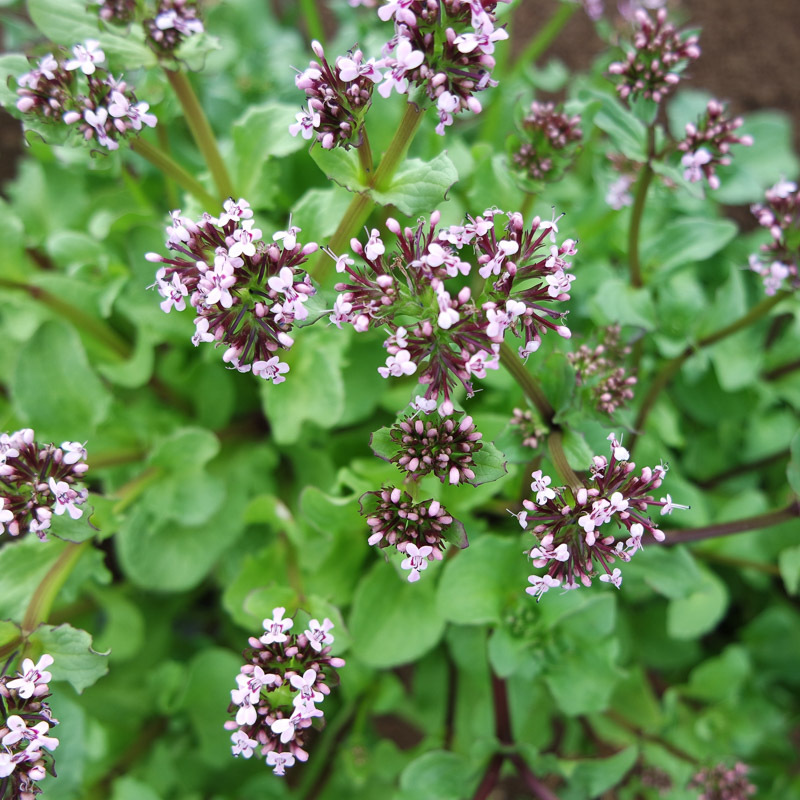 Doucette d’Algers is a cousin of corn salad with larger leaves and can be used in a similar manner, however it is a hot weather loving plant that thrives in mid-summer. Flowers are an attractive rose color that bees find highly desirable. While rare in North America, it is a wild edible in the Mediterranean and can be found growing in olive groves and grain fields. Native to Northern Africa, our seed originally came from Patrice Fortier of La Societe des Plantes in Saint-Pascal, Quebec. Aka, African Valerian, Algerian Corn Salad. 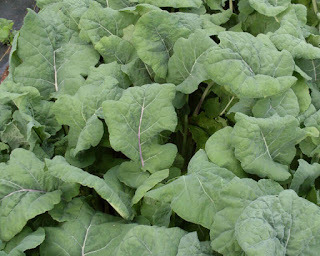 Madeley Kale (Organic) Brassica oleracea. 30 days baby, 60 days full. An extremely vigorous flat leaf, heirloom green kale from England. Hardy, tender and sweet. This kale frequently outgrows every other kale we plant in the summer, and out-produces most other kales through the winter as well. Justin Huhn of Mano Farm in Ojai, California, writes, “Madeley really is the star, just producing a ridiculous amount of food. Madeley kale is the backbone of our CSA.” Related to Thousand Headed kale. Multiple growth tips produce plentiful sprouting kale raab in the spring to fill the hunger gap. Given to The Seed Ambassadors Project by the Heritage Seed Library in England. Queen of Crunch Crisphead Lettuce If your family likes really crispy lettuce, new Queen of Crunch is for you! 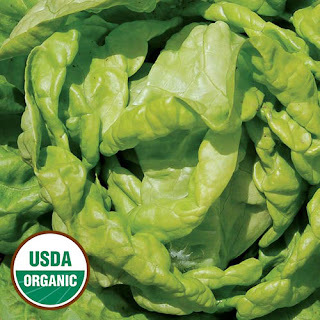 These crunchy, juicy green leaves really shine in mixed and chopped salads, stand up in tacos, add something special to sandwiches, and are perfect wrappers for meat and cheese. 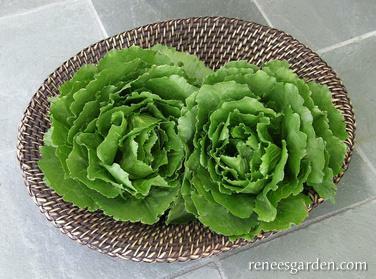 Queen of Crunch is a heat tolerant, sturdy lettuce that grows quickly and matures into attractive heavy rosettes that keep well. Pick the whole head, or harvest the outside leaves over a long period. Tennis Ball Butterhead Lettuce Small rosettes of light green leaves measure only 7" in diameter and form loose tender heads. Grown by Thomas Jefferson at Monticello. 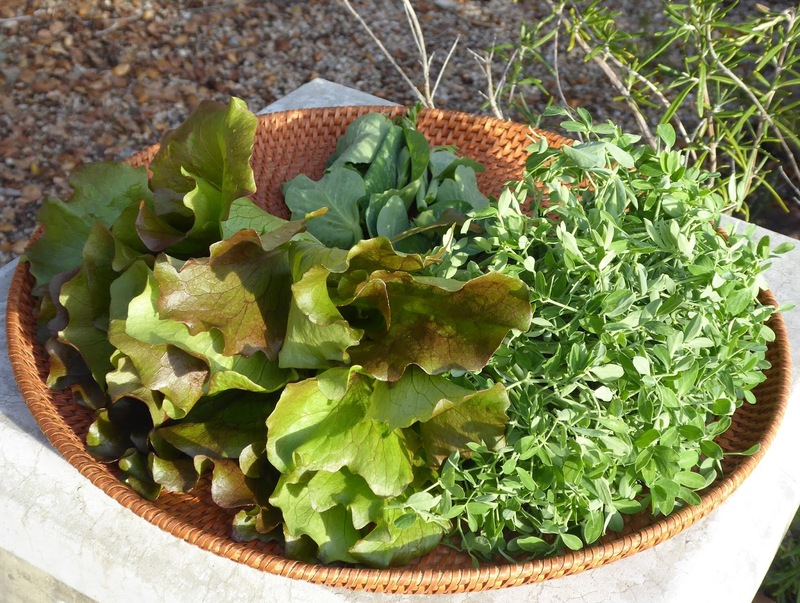 According to Heirloom Vegetable Gardening by SSE member William Woys Weaver, tennis ball lettuces were often pickled in salt brine during the 17th and 18th centuries. Black-seeded. Butterhead, 50 days. Hilmar Parsley Root, (Organic) Petroselinum crispum. Pure white, 8” half-long shaped root vegetable with a mild parsley flavor. Roots are broad at shoulders, tapering to a point. Very aromatic and great in soups or roasted in the oven. 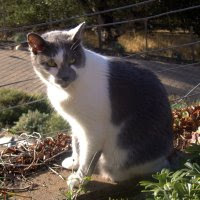 Hilmar really shines as a winter vegetable when it sweetens up after a frost. Plus it’s very cold hardy – it was one of the crops that overwintered outside during our record cold snap in December 2013 (lows of 5° F)! Leaves can also be eaten. 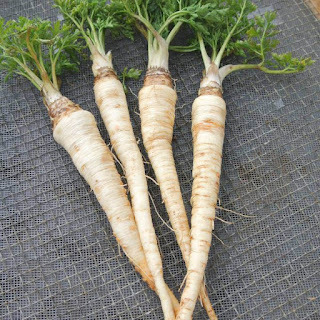 Of the several varieties of parsley root we have tried, Hilmar is hands down the most vigorous – important for a root vegetable that, like parsnips, is relatively slow to start. Big strong tops make for good weed competitiveness, easy harvest and are nice for bunching. Sow in early June for harvest in October through February. Magnolia Blossom Snap Peas This highly productive, 5-8 foot tall vining snap pea has eye-catching bicolored purple blossoms that really shine in the garden. These pretty flowers are soon followed by an abundance of well filled, crunchy-sweet, plump pods. Keep the succulent pods picked (they are delicious right off the vine) and the vines will keep producing pods over a long harvest season. Sow again mid to late summer for fall harvest. Magnolia Blossom vines easily twine up any vertical supports making it quick and easy to harvest them. Royal Snow Pea Deep purple pods. Part of the Calvin's PeasTM Collection. Attractive pods avg. 3-3½". Flavor is pleasant, though mildly bitter. Makes a nice addition to salads, coleslaws, or may be used as an edible garnish. Best used raw but may be lightly steamed, microwaved, or sautéed. Stays purple if lightly cooked but will become "muddy" colored if overcooked. Pods that are overmature, or exposed to high temperatures, may diminish in color to a mottled purple. Attractive pink flowers. The 30" vines can be grown with or without support. 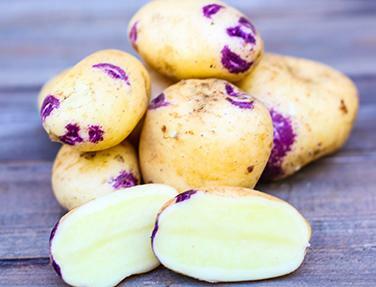 French Blue Belle Potato Originally from the rich soils of Bretagne, these handsome, oval potatoes have a pastel skin with violet-purple splashes around the eyes and succulent creamy yellow flesh. The superb flavor of these unique tubers is making quite a splash with chefs and foodies both here and abroad, and you can expect to see Blue Belle being featured on menus and in the press. 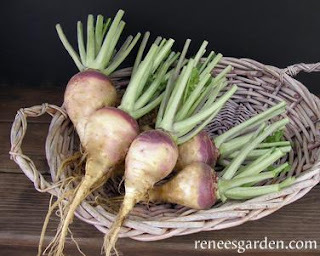 Improved Helenor Rutabaga This easy to grow Dutch rutabaga (a.k.a. swede) has a fine texture and warm, rich flavors like apples crossed with turnips. High yielding Helenor roots develop good color early, with creamy exteriors splashed with violet and yellow interior flesh. 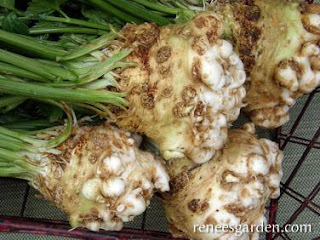 This mainstay root vegetable is ready to harvest and enjoy from tennis to softball size to use as needed from the garden. You’ll love them tossed in olive oil, then roasted or sautéed to bring out their natural sweetness. Amsterdam Prickly Seeded Spinach Traditional crop in Europe for generations. This type was grown by Thos. Jefferson in the early Nineteenth Century. In 1806, Bernard McMahon of Philadelphia said it was “the hardiest kind,” and that may well be true to this day. Leaves are more pointed and arrow-shaped than the common type. The sturdy plants yield over a long season, producing flat, tender, medium-green leaves with red-tinged stalks. Slower to bolt than ordinary spinach. Traditionally sown in late-summer or early fall for harvest through autumn and into winter. 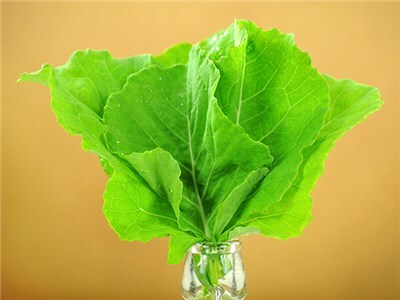 Little Hero Spinach Little Hero is perfect for growing in containers and small spaces with crunchy-sweet leaves that are easy to harvest at baby size for scrumptious fresh spinach salads. 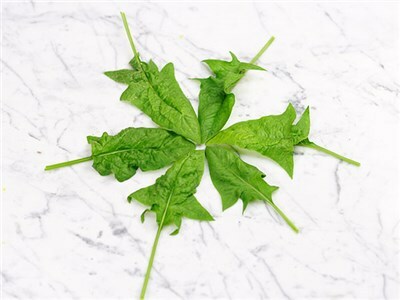 The crisp, but tender-textured smooth leaves have a mild, nutty flavor with no metallic overtones. 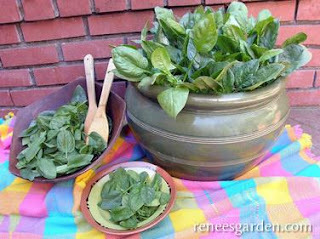 Plan on going right into the garden with your salad bowl to pick the deep green oval leaves at their fresh flavor peak. This vigorous and fast-growing spinach is highly ornamental in containers. Tatume Squash 65 days. A must in Mexican cuisine, and also popular in certain parts of Texas. 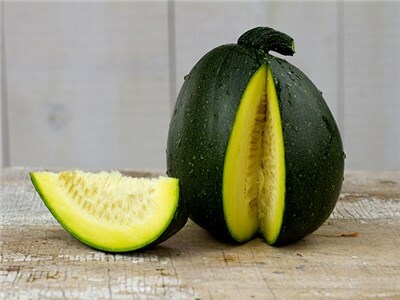 This old heirloom is picked small and used like zucchini, but these are so much better than standard supermarket zucchini! Round to slightly elongated, flavorful fruits are green in color; vigorous vining plants are fairly resistant to disease. Doran Round Butternut Squash (Organic) Cucurbita moschata. 100 days. Small round butternut from the Netherlands. 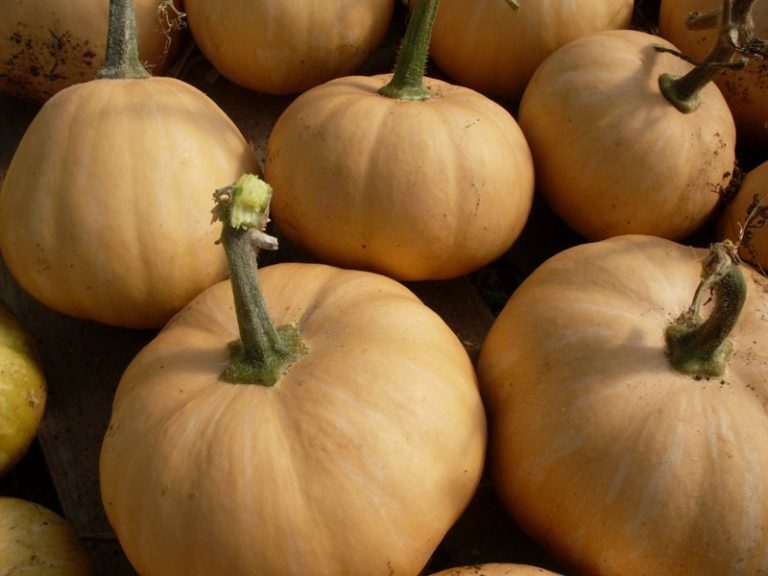 Unique compared to other butternut types as it looks more like a buckskin-colored, squat pie pumpkin than a butternut. 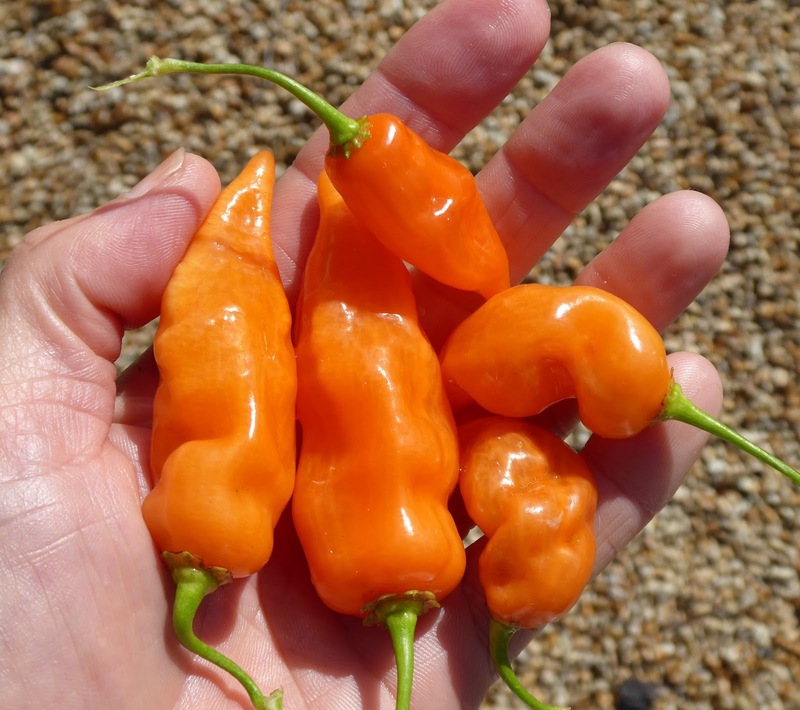 Very delicious sweet flavor develops more in storage and the flesh is a deep orange color. Some fruits are very round while others have slight ribbing. When properly stored (room temperature and dry) they can keep for over a year. Given to us originally by Lieven David, a plant breeder and seed saver we met during our first Seed Ambassadors trip to Europe in 2007. Days to maturity is fairly late for the PNW at around 100 days, but the 2-4 lb fruit can be picked earlier and cured inside with great results. Cisineros Tomatillo (Organic) Physalis philadelphica. 75 days. 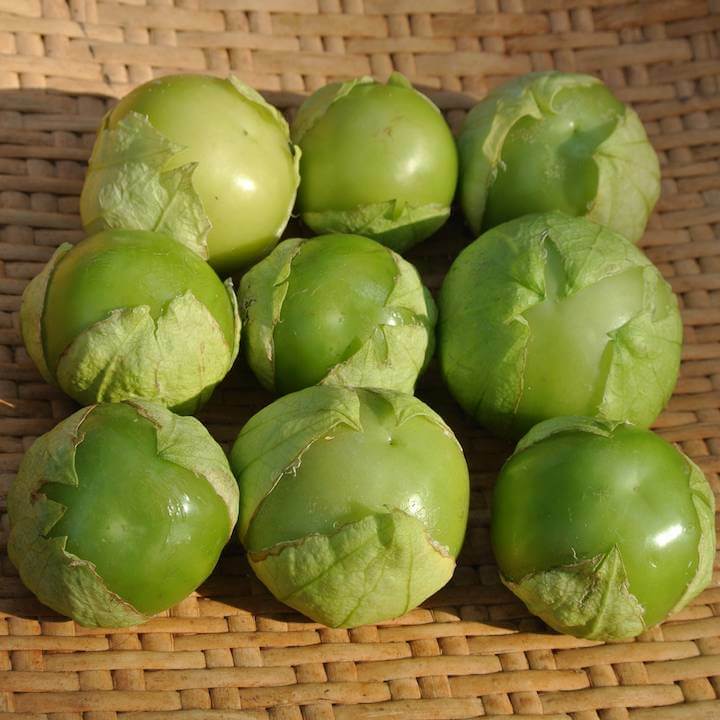 A large, green tomatillo, similar to Plaza Latina Giant Green but a little earlier to mature and not quite as big. 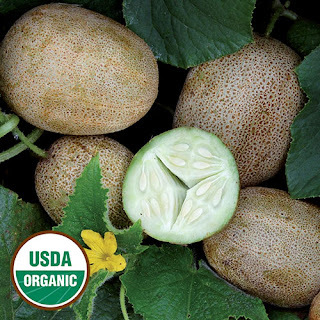 Fruit are 2½” wide and a great choice for market farmers and gardeners. Under-ripe fruit are apple-green and a nice tart addition to salsas, but we also like sweetness that comes with yellow-green ripe fruit. Sprawling plants benefit from a trellis, but will crawl around on the ground happily. Always have more than one tomatillo plant in your garden, as they are usually self-sterile. Brad's Atomic Grape Tomato 75 days. Elongated, large cherries in clusters. The color (and flavor!) 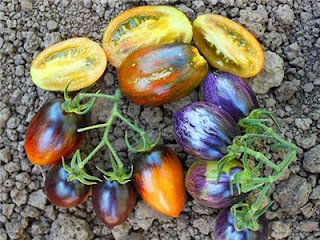 is a full-blown assault on the senses—lavender and purple stripes, turning to technicolor olive-green, red, and brown/blue stripes when fully ripe. Really wild! Fruits hold well on the vine or off, making this amazing variety a good candidate for market growers. Olive green interior is blushed with red when dead-ripe. Crack-resistant fruits are extraordinarily sweet! Wispy foliage looks delicate but belies these plants’ rugged constitution and high productivity. This release from Wild Boar Farms won best in show at the 2017 National Heirloom Expo! These range some in size from a large grape to plum-sized. Cesare's Canestrino di Lucca Tomato A rare heirloom sauce tomato brought to the US by Chef Cesare Casella from his hometown of Lucca, Italy. A very unique flavor profile with a discernible funk, Cesare's Canestrino di Lucca is a very dry sauce tomato with a deep, rich red color. 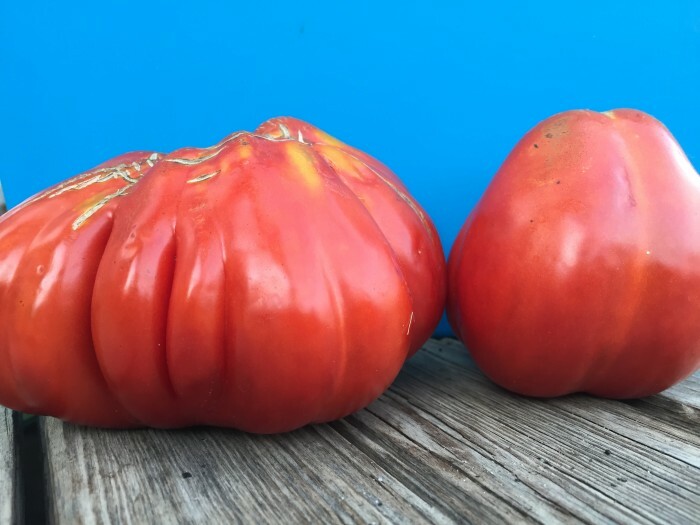 This is the first time seed for this variety is being offered for sale to the public through our seed grower partner Zach Pickens of Farm Tournant. Pigletwillie’s French Black Tomato (Organic) Solanum lycopersicum. Maroon/Brown. 75 days. Indet. Sometimes a name is all you need to decide to grow a variety. Amused enough by the name, we were on the fence about growing this variety when a customer sent us seed a few years back. But since that customer is John Miller from the Old Schoolhouse Plantery in Vermont, who as a nurseryman, has an eye for good varieties (and is our original source for the Cilician Parsley that we love so much), we decided to give this one a go. John’s hunch is that this tomato originally came from former garden blogger Pigletwillie, when he was on vacation in France some years back. Dark, 2-3” fruit weigh 2-3 oz and have a full-bodied meaty taste. 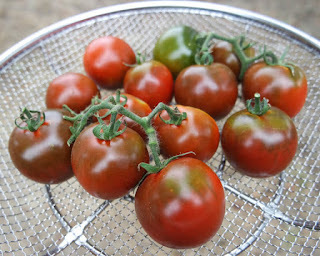 Not a true black tomato, but very dark red with chocolate shoulders. Fruit ripens in clusters of 4 or 5 and can be harvested by snipping the cluster stem. Aka, Piglet Wille’s French Black. 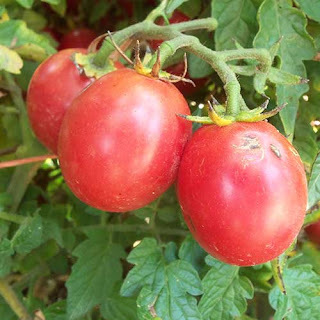 Rose Hill Pink Plum Tomato Donated to SSE by Jean Patten of Kansas who obtained the variety from Jesse MacKay of Rose Hill, Kansas. MacKay acquired this tomato from her father-in-law who grew it for many years before her and “used to bring these tomatoes to [his neighbors] by the bushel.” Patten expressed the local popularity of this tomato in her donation letter, writing, "Most of the gardeners I know grow them." Plants are extremely productive and bear 1 ½” oval fruits that are pink, juicy and sweet. Tasmanian Chocolate Tomato Strong-yielding, short, sturdy vines offer beautiful, plump mahogany red/orange, faintly striped tomatoes with delicious, well-balanced flavor. Great for pots and small spaces. 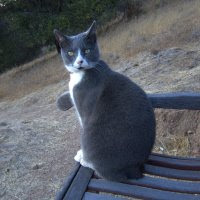 My tenure as host of Harvest Monday is ending this week, please remember to check in with Dave at Our Happy Acres next Monday to join in the fun. 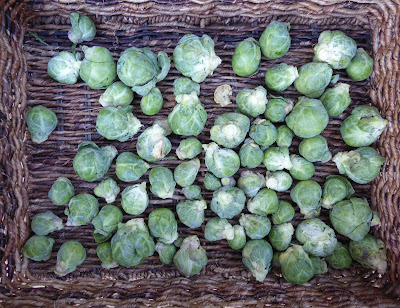 I'll start off with something new, a long anticipated and rather disappointing first harvest of Brussels Sprouts. If this had been my first experience with growing Brussels sprouts it likely would have also been my last. By this time last year I had harvested 15 pounds of sprouts in January alone and that measly harvest shown below didn't even make it to 1.5 pounds. Oh the differences a year and a decimal point make. 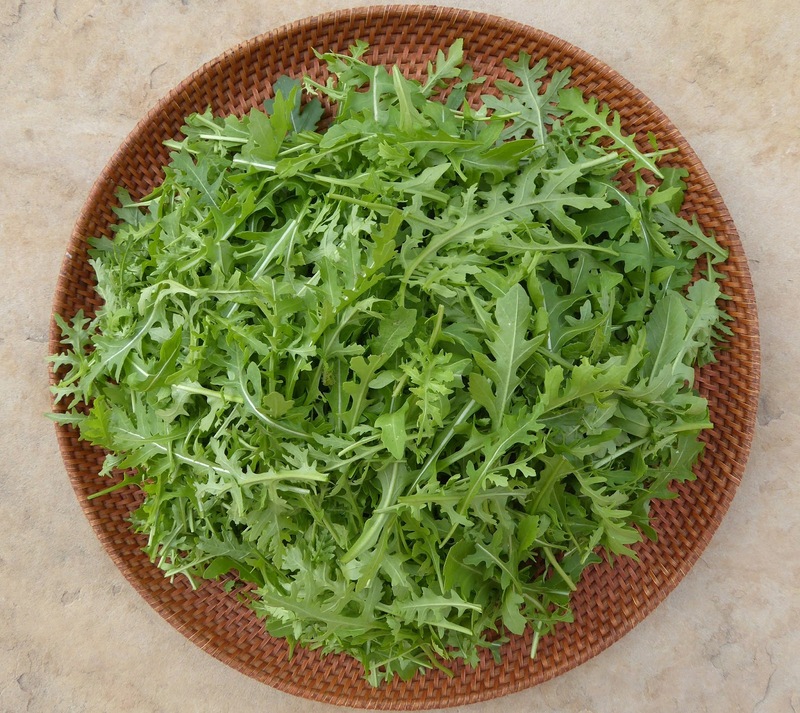 On a happier note, I got another generous harvest of Speedy arugula. The fall planting has been producing since September, although with a break in the short days of December, and is only now showing signs of bolting. 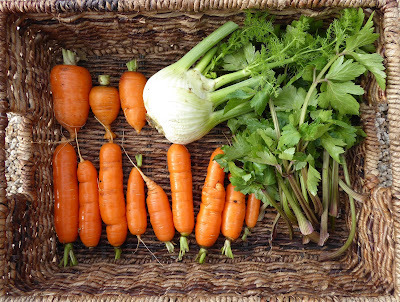 The last of the Short Stuff and Bolero carrots hit the harvest basket. The runty Pink Plume celery proffered up a few small stalks, and the amazing Orion fennel produced yet one more bulb of many from a root that got left behind after the first bulb was cut in the spring. I cut another few baby lettuces and trimmed back a few more Petite Snap Green Pea plants. And I found a few more Habanada peppers for the final harvest from those plants. I've been browsing through a few cookbooks that I borrowed from the library recently and found an easy and delicious new-to-me way to prepare cauliflower. April Bloomfield has a recipe in her book "a girl and her greens" for Pot-Roasted Cauliflower with Tomatoes and Anchovies. Super simple. Take a whole head of cauliflower, brown it a bit all over, then roast it with a tomato sauce until tender. The recipe seems to have been a popular one with reviewers since it can be found on a few websites such as NYT Cooking. I'll admit to taking one shortcut, instead of browning the cauliflower in the pan, turning, turning, turning, splatter, splatter, splatter, I slicked the head of cauliflower with oil and roasted it in a 500ºF oven until it was lightly browned and then put it in the pot with the tomato sauce to roast it. It was delicious and made an impressive looking presentation. Another dish that I made that involved a new way to use tofu came from Melissa Clark's book "Dinner". I used some of my runty Brussels sprouts to prepare Thai-Style Shredded Tofu with Brussels Sprouts. The recipe calls for extra firm tofu which you grate on the coarse holes of a box grater. The Brussels Sprouts are thinly sliced to shred them and then briefly sauteed, the shredded tofu is stirred in and just heated through and the dish is seasoned with a Thai-style sauce featuring lime juice, fish and soy sauces, and chiles. Peanuts add some crunch. It went together quickly and easily and was quite tasty - my style of cooking. I love to prepare and Dave loves to eat one dish types of meals and that's what Melissa's book is all about. Her book is one that will probably end up in my collection. If you have a harvest you want to show off then enter a link to your post below and please leave a comment too. And remember next week to return to Our Happy Acres to link up with Harvest Monday. It's been over a month since my last garden tour. Some things have been cleared out, some things have been planted, and some things have been growing since then. First a couple of shots from the hillside for an overview. It was a beautiful morning. The air was clear and crisp after some overnight showers and the foliage in the garden and surroundings was sparkling clean. The sun peeked out off and on from between big fluffy clouds. Bed No. 1 was where I grew tomatoes and peppers in 2017. I cut down most of the tomato and pepper plants a couple of weeks ago. I kept the trellis that the tomato plants were trained upon in place to provide support for the fava beans that I set out in the garden last week. There's a baby fava plant under each of those water bottle cloches. This year I tried something new with the favas, instead of sowing the seed directly into the garden I sowed them into paper pots and not long after they poked their first leaves out of the soil I transplanted them into the garden. That sped up the germination quite a bit, from about 3 weeks in the cold garden soil to about 1 week in the pampered paper pots. The area where the pepper plants had been growing is temporarily covered with cardboard just to protect the soil from being splashed about by the rain. I've got some low growing pea varieties starting in paper pots to plant out in part of the space and I've ordered some garbanzo seeds to fill more of the space. You can barely make out the fava bean seedlings growing in the protection of the cloches. 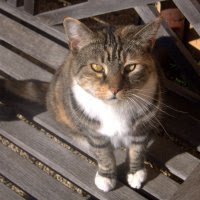 The protection is more to keep the rodents and birds from munching than to keep inclement weather at bay. I kept the Aji's and the Jalapenos and the Ethiopian Brown plants in the garden because as you might be able to see there are still some ripe and ripening peppers on them. Joe's Giant Aji has some particularly nice peppers hanging on. And I left the Piccolo Dattero tomato plants because I couldn't bear to rip them out when it they are still producing clusters of tomatoes like this. The most significant growth in the garden at the moment is in Bed #2. This bed is where I'll be growing brassicas and greens and such through the year. The cage is keeping one lone Aji Amarillo Grande plant from 2016 in bounds so that it doesn't overshadow newer inhabitants in the bed. On the right are some baby kohlrabi plants. The poor things are recent victims of a vicious vole attack. They should be at least three times their current size. And that's why everywhere you look there's hardware cloth. The little effers go for the easy pickings and seem to be disinclined to scale the hardware cloth to get to the goodies on the other side. They will however burrow underneath the cloth so I have to be sure to not leave any gaps and to mound the soil up around the edges. Further down the bed are new Broccolini plants. I use the sleeves to protect young seedlings from sowbugs which don't seem to be able to crawl up plastic. And even further down the bed is a large planting of Syrian Medieval Chard. I want to save seeds for this variety because the sole source for my seeds is no longer in business and I rather like this variety. Chard is one of those plants that require a fairly large population of plants to produce good quality seed so I'm growing the minimum number of plants that is recommended. This corner of the bed will be a jungle this spring. Inside the tunnel are some Violette du Gournay radishes, the only variety out of the 3 that I sowed that didn't all bolt. And there's some seedlings of a couple of varieties of mustard and one row of scallions that I hope won't be blasted by downy mildew before they are large enough to harvest. Winter peas are picking up the pace and starting to bloom. Lettuces are starting to fill out and I've started to harvest some of the extras as babies. And here you can see why I kept that old Aji Amarillo Grand plant from 2016. In Bed No. 3 another holdover from 2016 is some Batavia broccoli. It's on the short list for the compost bin. The fine greens growing at the base of the broccoli is Cilician parsley. I sowed that in late January or early February last year. It has become my favorite parsley. It has a fine texture and complex flavor with a hint of nutmeg to my taste and the flavor isn't as "green" as most flat leaf parsley varieties. It's also a workhorse in my garden. I found that if I just keep cutting it it just keeps growing back and it resists bolting. I love the stuff. The fennel plant that just keeps giving. I sowed seeds for fennel back in April. They got off to such a slow start that I managed to interplant some arugula, mizuna, and Tokyo Bekana napa cabbage for baby salad greens. The few fennel plants that grew finally got going and gave me a few bulbs. Some of the roots that got left behind after cutting the bulbs put out new shoots and gave me another round of bulbs. And one root in particular has produced a number of extra bulbs. So this year I'm going to experiment with devoting a space to cut-and-come-again fennel production. The biggest problem with fennel is that it is a favorite target for both birds and voles. There's also a patch of a dwarf variety of chard still hanging in there. Some mini daikon radishes are also doing well. The smaller plants were victims of a vole that had dug it's way into the cage but they have recovered nicely. Most of them are large enough now that they are pushing their shoulders above the top of the soil. It's time to start harvesting. The last of the overwintering carrots are looking rather sorry. The Petite Snap Green peas are producing more than greens now. The spring sown Batavia broccoli is on the short short list for the compost bin. I'm trying to force the runty Pink Plume celery to grow upright. One plant managed to make somewhat acceptable sprouts. Same sorry story for the Kalettes, 5 plants with only one producing somewhat acceptable sprouts, the rest look like this. The Broccolini plants produced a few rounds of really nice shoots but now they are slowing down. No, that wasn't a vole attack, it's the aftermath of a harvest, whoopee! The before shot. I hope to get one more harvest but the plants are starting to bolt so they may try to put their energy into flowers rather than foliage. Spinach plants coming along, so far so good. A failed experiment with a winter sown round of Fioretto Stick cauliflower is now cleared out, closed in, and sown with arugula, cress, mizuna, and Georgian Flat Leaf parsley. Further proof of a mild winter so far, the nasturtiums are still alive. Bed No. 4 is where I'll be growing the tomatoes and peppers this year. For the last few years I've been preparing the tomato and pepper bed by growing a cover crop that I cut down and dig in. I sowed the bed with a mix of Kodiak mustard, peas, favas, and a blend of grasses back on the 17th. I cover the bed with lightweight Agribon fabric to keep the birds from devouring things and to protect the soil from rain. That lump under the cover is the foliage of a winter potato experiment. The mustard germinates really quickly. At the far end of the bed I'm experimenting with a variety of snow peas that are specifically for autumn sowing and are very resistant to frost. They have really taken off in the past couple of weeks and are already blooming. And what lovely blossoms they have. I hope the peas are as tasty as the blossoms are beautiful. That's the latest from my garden. Winter, California Central Coast style. I've been busy ordering up seeds so I will soon be writing up a post about the new goodies that I've found. Stay tuned!